> not the least bit secure. > Vyse finding Menkaure's cartouche. I'm sure you don't mean that. > cartouche painted on the ceiling of the chamber. "The name of Menkaure found written in red ochre on the ceiling of the burial chamber in one of the subsidiary pyramids." > assumptions of the antiquarians. > the 12th-9th cent. b.c. I think you may be mistaken. [See Martin's post]. I find no information the coffin itself was RCD, but rather only the skeleton found inside (?) which dated to less than 2,000yrs ago (other sources, the 2nd century AD). Verner. 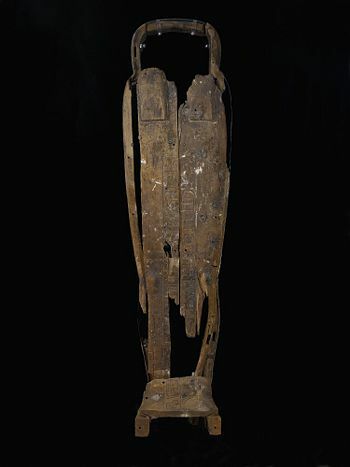 The coffin was not part of the original funerary equipment of Menkaure, but was made for a later restoration of his burial, as indicated by both stylistic and epigraphic evidence. Its quantity in context that matters. > cent b.c. and his coffin was an intrusive burial. > transpire during the 4th dyn. > old 'it's well attested'. I am confident the RCD is correct and that in fact both coffin and body are intrusive. But, no, neither have anything to do with why Menkaure is placed in the 4th Dynasty regardless. Yes, Menkaure is missing, but here we have a list that shows the 4th and preceding 5th Dynasty kings (among others) in more or less the correct order. All 4th Dynasty kings (among others) in the correct order. There are other lists that predate Manetho which show the correct order as well, meaning no, again as we have discussed this before, the placing of Menkaure in the 4th Dynasty group has nothing to do with Manetho which as we can see goes as far back in King Lists to at least the 19th Dynasty. Also, speaking of Manetho, he lived in the 3rd century BC yet Herodotus, nearly two centuries before, wrote of the pyramids of Giza belonging to Khufu, Khafre, and Menkaure respectively, yet for some reason you still think this all hinges on Manetho? The inscription was badly eroded and has only been partially translated. It says Menkaure was buried on the twenty-third day of the fourth month of the winter season, about MArch, with all his possessions. The year was eitehr not present or eroded away. Four cartouches are barely visible, the names in three cannot be read, the fourth contains Menkaure's name. This is all I have time for to put together off the top of my head, but I'm sure the readers get the picture. 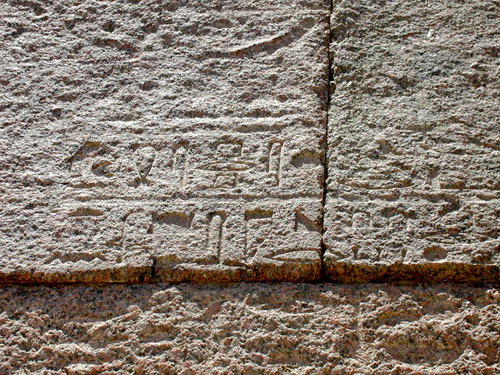 Among others, if I recall, there are also few 6th Dynasty stele from Pepi I and Merenre I at G3's mortuary temple which also mention Menkaure by name, but am not finding the translations at a glance. The idea Menkaure belonging to the 4th Dynasty pharaoh group or that he was associated with G3, regardless of "whether he built it or not", is only based on Manetho simply has no merit and is clearly contradicted by literally all of the evidence. Though, to be fair, Debhen's account does not say what the nature of the work to G3 Menkaure was doing, I have no reason to believe it is not an authentic account belonging to the period it is ascribed. Edited 6 time(s). Last edit at 05-Mar-17 03:57 by Thanos5150.